Able to sneak around the battlefield, the T20 is an good support tank, able to switch between engagements quick succession. However, like most support tanks, it has little to no armor and even lacks a gun mantlet thus caution must be taken to avoid enemy fire whenever possible. Pick different strategies to match differing opponents: flank heavy tanks, ambush and brawl mediums, track and destroy lights. Passive scouting is very viable when normal scouts are not available. Good view range and camo for its tier. 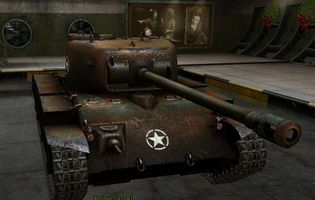 The T20 is a second-line tank that sports a great gun, good mobility, camo and view range, while having absolutely no armor at all. As such, it mostly only performs well with the help of other mediums, and should never in any case deliberately get into a brawl with another medium, or defeat will be inevitable. 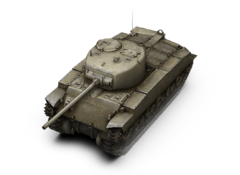 The 90mm gun of the T20 is a great weapon, having good aim time and accuracy, while also having decent penetration and accuracy on the move, thus the T20 can actually easily penetrate tier 8 heavy armor from the front, provided APCR is used. However, this is compensated for by the low ROF, which is the worst of any tier 7 medium. Getting into a medium brawl in this tank would spell a death sentence, especially with the kind of armor it has. The armor of the T20 is absolutely terrible: Weak armor all-around and it even lacks a gun mantlet of any sort. This makes the T20 ill-suited for close quarters hull-down encounters, where damage can be easily taken at any point of exposure. At long-range, the armor is less relevant, and combined with the small size of the turret makes the T20 a harder target to hit. Nevertheless, the armor is still weak, and thus teaches players to flank and find alternative, safer routes of attack instead of tanking head-on in a very inexperienced manner. The mobility of the T20 is good, but not great. It can reach speeds of 50km/h, and turns well, but the acceleration is sluggish and the traverse is not good enough to circle Soviet heavies. However, it is still a nimble machine and can easily change skirmishes to plug holes in the formation. The T20 is a formidable machine, but much like the Leopard 1 requires skills to play. While not possessing great armor, the T20 is still a good mobile gun platform and can easily shoot any unsuspecting tanks full of holes. Take the time to read the map and support allies whenever needed, don’t go alone even when enemies are few, and flank instead of facing tanks head on, and the journey to the M26 Pershing will be a painless and easy one.